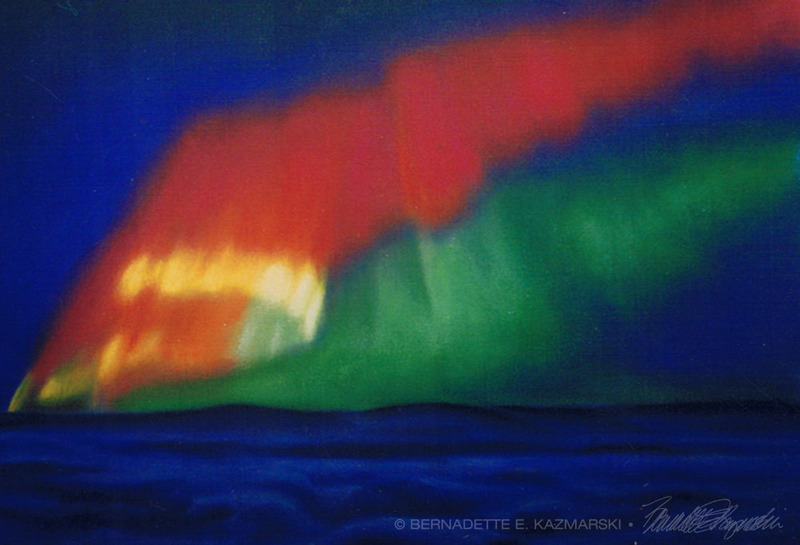 “Aurora Borealis”, a sketch I did for an illustration for a book about two polar bears who…I don’t remember the story line, but I do remember checking my voice mail at home while I was at work that last autumn I was at my day job, and listened to the message from the small press publisher who’d found my art online. He had an idea for a book that incorporated text and art, and he liked the style of my pastels and how I treated animals in my paintings, and he also saw that I was a graphic designer and freelanced as a book designer. He wanted me to illustrate and design the book. That one call was “it”. I had been freelancing full time nights and weekends as well as carrying a schedule of new paintings and art exhibits monthly and was still working full time, but knew the time was near. I could live on what I made from the book publishers and the other customers I had at the time, one of them a home builder who had me create artist’s renderings of his house plans and flyers from that. The art sales were gravy. My office was set up, my car was paid off and the only other debt was my mortgage, money in the bank, health insurance and retirement set up. But was I really ready? I only needed one good nudge. That call was it. In fact, I suddenly felt a little panic. Had I waited too long? Should I be home right now? Was I missing calls? That was why I checked my voice mail during lunch, but without caller ID, how would I know if someone had called and not left a message? I had to be at home! January 1 is the anniversary of the day I began working at home and it’s very easy to remember what year I’m celebrating because that day was January 1, 2000. I still remember that first day, going to sit at my desk in the room downstairs even though it wasn’t really a work day. I’d been freelancing and working at that desk in the corner for a few years already, and looking out the two big windows to watch birds at the feeders and observe the neighborhood, my desk and the windowsills lined with my family of felines, happy I’d be sitting still for a while so they could get in a good bath and nap on me and my papers. I had done the sketch during the evenings while still working, but photographed it to send a print to the publisher on pretty much my first day working at home, along with photographing some other artwork, and some other photos on that same roll, reference photos that later became award-winning works. Reference photo for “Warm Winter Sun”. 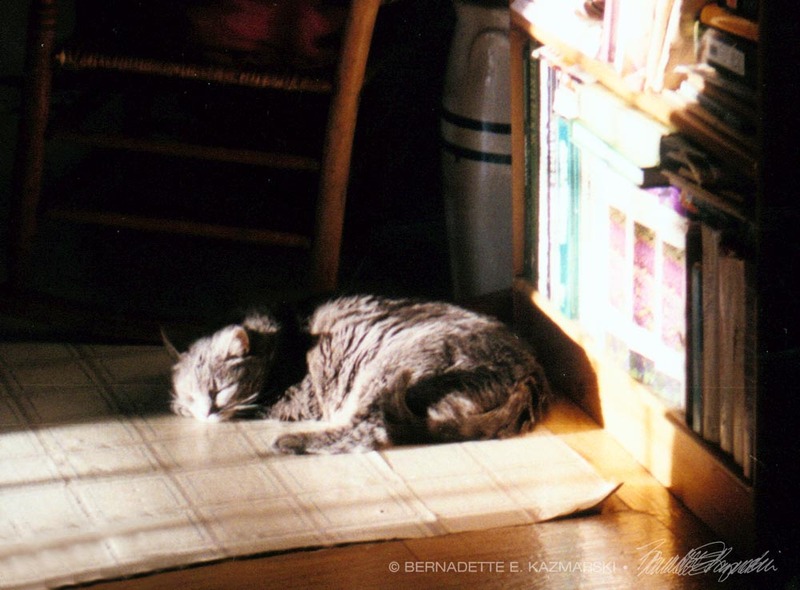 That’s Moses sleeping in about the same spot as Namir in the other photo, but she had been there earlier. The sun is a little higher on the bookshelf. I remember debating between the two and I had intended to paint both, but only painted Namir. Fifteen years later, I can’t tell you why, but I do know that one of my goals was to focus on photography generally, photograph my cats more often so I had lots of reference photos, and get around to painting them way sooner than before, like paint them as soon as I got the photos back. 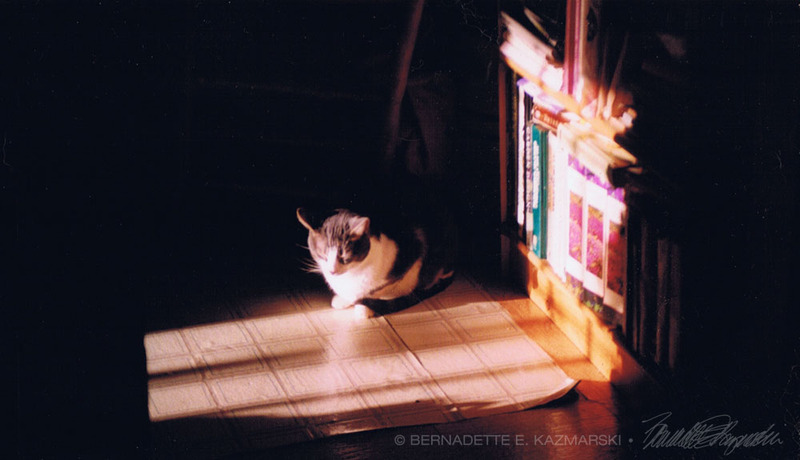 And so I did, because instead of waiting a decade as I had with other photos I entered the painting of Namir and won Best Pastel in South Hills Art League’s 2000 Annual Juried Show. I’ve sold framed prints of the photo of Moses, but I think this spring I’ll paint the one this photo and we’ll see what 15 years of experience in painting has done to my style. Reference image for “The Goddess” linoleum block print. 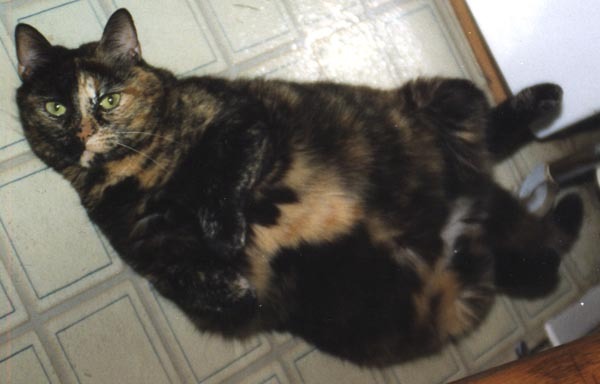 Yes, Cookie really did lie about on her back like this, and I decided to take her photo. The image stayed with me, and a little later that year I suddenly visualized the hand-colored block print you’ll see by clicking on this link. I decided making a block print, something I could reproduce but was still an “original”, would be ideal for donating to shelter events and to sell at animals events I attended, and so it was. I didn’t get to do it right away but waited until 2001 when I had the time and the idea for a set including “The Roundest Eyes”. And also because my brother had suffered a traumatic brain injury in April 2000 and became my responsibility as he moved through his recovery, and then my mother developed lung cancer and had surgery and barely recovered, both of them incapacitated with multiple medical conditions and in care for the next decade as I was legal guardian for my mother and POA and representative for my brother. We never know what will happen to change our plans, and those two medical emergencies certainly changed the business plan and list of objectives I had spent a decade determining. But my felines were there for me, unconditionally, at the end of a long day at the computer; below, my desk in summer 2006 featuring Stanley curled next to Sophie, Kelly bathing, Namir and Cookie curled in front of me and Peaches having a good scratch on the file cabinet, six cats…. 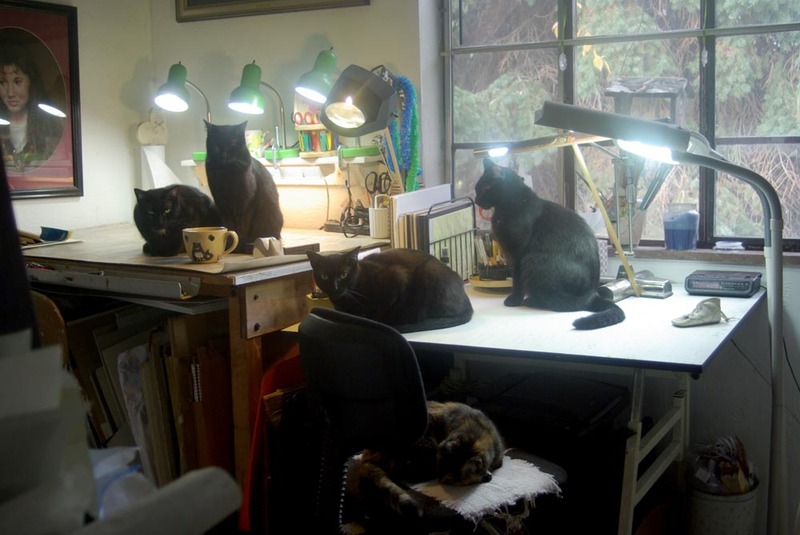 Desk with six cats, taken in 2006, but typical of my desk at any given time. …or an all night project, or when I came home from a long day at one hospital or another, or a day of doctor appointments. It’s 3:00 a.m., do you know where your human is? Over the years my customers and work projects have evolved as has my family of felines, though lying all over my desk never went out of style, even in the wee hours when I was up with a project as in the photo above from 2010 with Peaches on a box, Mimi on the windowsill, Dickie on my desk, Cookie having a good bath on my paperwork, and Giuseppe being vigilant. It really was 3:00 a.m.—there were plenty of times in my mother’s last years that I was off at a hospital unexpectedly for hours to see to her care that I just worked whenever I could, and my cats took it all in stride. And yes, Stanley and Moses and Cookie and Sophie and Namir and Kelly and Nikka were very glad I just quit going to work one day, and we’ve never looked back. I’m so glad I was home for their last years. Last autumn I once again repaired the keyboard shelf on this desk and I remembered that, including the time I’d spent freelancing in the 1990s, I’d been working in this same corner of the room for 25 years and at this desk for 20, and as much as I love the views out the windows, the convenience to the kitchen and outdoors and all the memories, I was really tired of that spot! About three years ago when my keyboard shelf first fell off my desk, rendering it unusable for me because of where I need to have my keyboard positioned to avoid repetitive motion strain injuries, I temporarily abandoned the desk and set up shop in my studio, and currently split my work between the two places, design as well as art. I resisted a computer in my studio for years because I would repeatedly check my email and other electronic things, but now I’m pleased to have two computers networked and two equally suited workstations. Most of all I also enjoyed the change in scenery and found the room conducive to writing as well, and began moving more and more of my writing up to my studio. As my work has included more fine art, writing and creating gift items and less commercial graphic design, I’ve been spending more time in the studio and enjoying every minute. For many years it was the “spare kitty room”, holding many memories of sitting in that room and looking out that window while trying to tame or comfort or treat a rescued cat, and may still serve that purpose again if it’s ever necessary, but I think I’ve moved that operation to the bathroom for now. I think my family of felines appreciates the change in scenery too, or they just like to make sure I am properly supervised as you see Jelly Bean, Mewsette, Giuseppe, Sunshine and Cookie on the chair. The Curious Quartet joins Cookie in getting ready for a day of work. Many things have changed in my commercial art life each year for the past four or five, the printers I use, the projects I work on, the amount of design work I have. Things changed in my art life too as I’ve loosened up and feel much more free in my work through the practice of my daily sketches, and I’m looking for more opportunities to market and sell my art and merchandise. I’ve also continued to find more places to publish my articles and stories, so I’m deriving more and more of my income away from graphic design. When I talk to students about being self-employed I tell them two things I’m sure they don’t listen to: learning to run a business is more important than performing your skill, and expect everything to change on a regular basis. You can read more about my background in my 13-year anniversary post from a previous year and about my education in my ten-year anniversary post and on my About page. 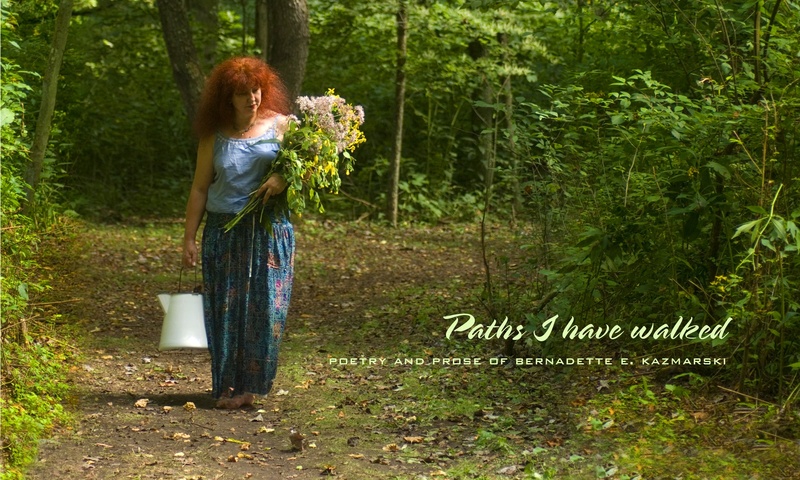 Also visit my blog What’s New in Bernadette’s Studio? to see current commercial projects and visit my main website in Graphic Design and Illustration to see projects by product and by customer.